Yet amid the exoskeletons of banks and cathedrals and luxury hotels overlooking a glimmering coastline that once buzzed with pleasure boats, an awful truth dawns. Mogadishu was never like other African cities. 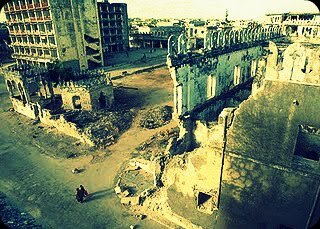 Mogadishu was a spectacular city. Even in its disfigurement, the beauty is still there—above all, in ghostly Hamarweyne, where photographer Pascal Maitre and I stand in the empty boulevard and squint out at the sea until a call to prayer from a nearby mosque reminds us it is almost five in the afternoon, after which all outside activity ceases. Anyone on the streets of Mogadishu by evening is inviting misadventure. Just before leaving, we go to the lighthouse, where we meet Mohammed. He sees us, two gaalo, or infidels, and our guards, and at first we hear his footsteps as he retreats somewhere into the shadows. Later he emerges and grows talkative. "We don't want to flee our own country," he tells me. "I don't want to be a refugee. We're ready to die here." An insightful article written by Robert Draper. Draper is a contributing writer for National Geographic.